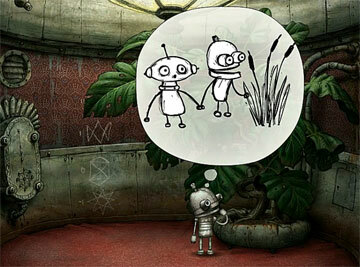 I've never really been a point-and-click game player, but when Machinarium appeared free on the PSN for Plus members, I gave it a try. I'd seen plenty of stuff on it previously- ads, reviews, and whatnot- but I hadn't been interested in it enough to pick it up, although I do think it was in one of the Humble Indie Bundles I purchased. 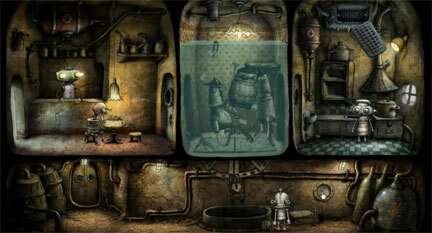 Well, it's difficult to say exactly why Machinarium stands out. It's a very short game, and a lot of the story doesn't really have the necessary motivations. You find yourself - an unnamed robot- dumped in a scrap heap at the beginning and try to find your way to your robot lady-friend, then you leave in a helicopter. There's just enough material to hold together a plot. But do they need anything more? In this case, no. There's also a bomb that just happens to be there for no reason other than you need to deactivate it, a hint system if you get stuck, and an inventory that NEVER is full (a relief). Really the game never bogs you down with difficulty or frustration. The puzzles are just hard enough to keep you going, but not hard enough to be aggravating. It might be of note to say there is also a small arcade with a couple mini games as well. Nothing amazing, but there is a small version of Space Invaders. It is also nice that there is a zoom function. The only reason I can think of having it would be to get a closer look at the wonderful backgrounds. Maybe it's the heart of the game- the nameless robot. If you leave him sit for a short time, he has small thought bubbles that appear and replay memories of his past including having moments with the robot girlfriend. And during the extremely short gameplay, he only ever helps other robots. I recall annoying a couple of others, but not directly harming anyone else. In a time when we are overloaded with First-Person-Shooters, killing everything in sight gets old really fast. Mechanarium isn't a game for everybody, but if you want something nice and interesting for 3 hours, check it out. Maybe you'll be charmed by this peculiar little robot too.